There's so much yet to share about my new Signature fabric for Art Gallery Fabrics. It's such a fun collection I want to take extra time and a more intimate look at my projects that went into the AGF Signature Look Book (plus the ones that never got their time to shine on the virtual pages). First, the Hexie Turtle, come on, how adorable is this!!!! I picked up this homemade footstool at a garage sale. This footstool was really pretty ugly when I first saw it and actually left the garage sale without it only to think about it more and return later to still find it there. Once I thought about making a hexagon patchwork cover for the stool THEN I could see it's value! After taking off all the UGLY upholstery and heavy fringe, I spray painted the brown painted wood copper for a little bling. I used Red Pepper Quilts Hexagon Tutorial for how to sew hexagons together and made a large enough patchwork to cover my turtle. A little bit of vintage fringe in a more appropriate scale for the stool and the results are nothing less than magical! Another footstool makeover happened to a piece I already had around the house. It too is a vintage, homemade stool I picked up at a yard sale years ago. It's now looking fresh and new with it's Signature Extempore Gala canvas top and vintage pompom fringe. Cute, huh?!!! For a tutorial on how to make the Hoop Art hanging above the chair, see my Signature Butterflies post. You may have noticed the fun floor lamp with the Flora and Fauna Hidden fabric lamp shade? Yup, I recovered a vintage lampshade for the most adorable coordinate for this baby room. This is my second time recovering this shade and it's even more special this time being finished in my own print. 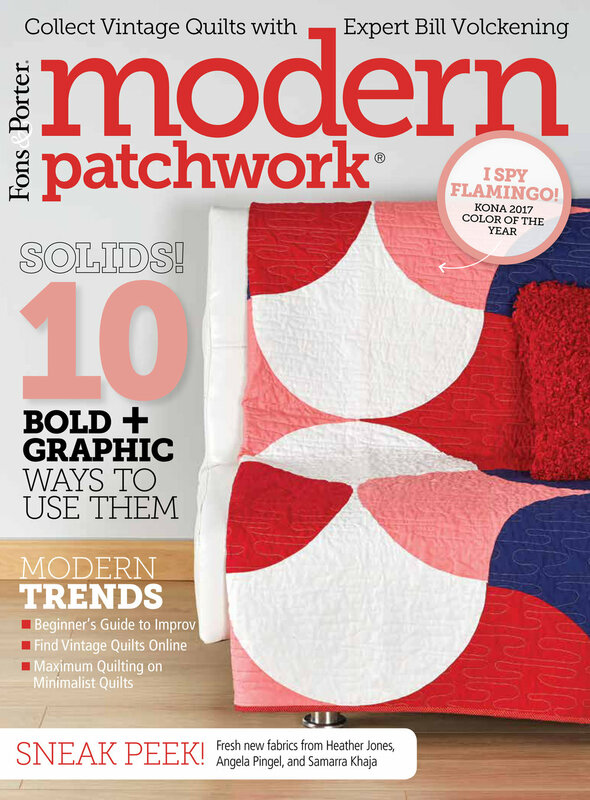 For an idea of how I made a new cover for this shade, visit the Craft Stylish tutorial. What a great way to customize the look of a room! This adorable tote bag made in Small World Sprightly print from Signature is a free pattern from Dritz Sewing. 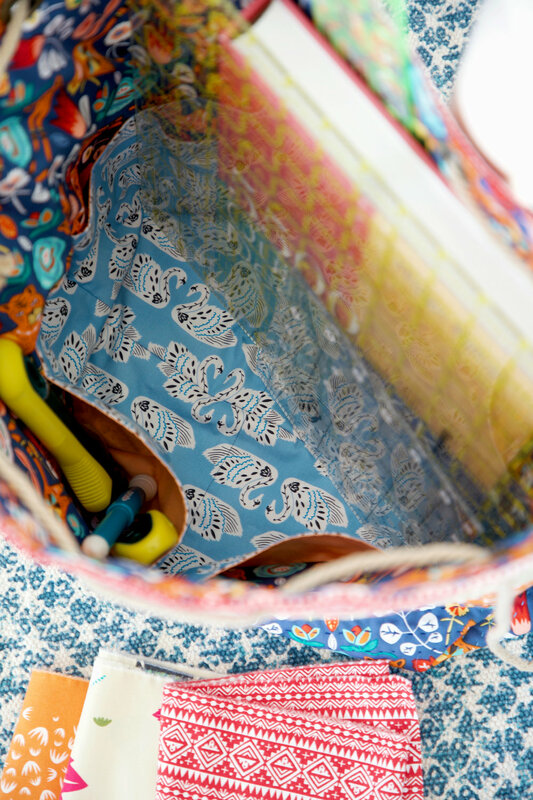 My bag is based on one of 20 different ways Dritz has used a basic tote bag and jazzed it up with their incredible assortment of bag hardware and Dritz sewing accessories. Discover oodles of amazing projects on the Dritz blog. I'm so honored they have featured my free Bucket Bag pattern on their Make Something Dritz blog: Favorite Finds: Bucket Bag Sewing with Signature Fabrics from Sharon Holland. I'm so pleased that Dritz and Omnigrid will both be sponsors of the My Signature Sampler sew along! Instead of using the canvas from my collection I sewed my tote with quilt-weight cotton. To give the bag more body I made two exterior bag shapes per the Dritz tutorial and used one for a lining which I added a big pocket before assembling into a lined bag. I simply slipped the lining, wrong sides together into the exterior, added a ribbon loop with Dritz D-ring to the upper edge and sewed the seam allowance turned-under edges to close. The fun coordinating Pencil Pouch is a free pattern on my Free Patterns page. 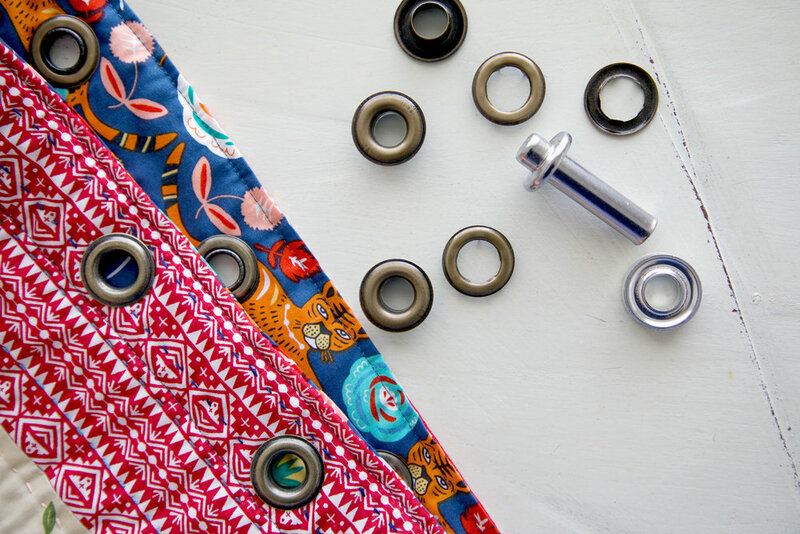 It's the perfect size for supplies and fits into a 3-ring binder with the Extra-Large Eyelets from Dritz Sewing. I love their antique brass finish! For even more fun, add a tassel with the easy-to-use Tassel Cap, also from Dritz. There's more Signature Baby's Room to share by I'll save that for next week's Part 2. If you're wanting to sew with Signature fabrics ask for them at your local quilt shop or shop online. Hawthorne Threads just restocked their supply and has the full collection plus bundles available. 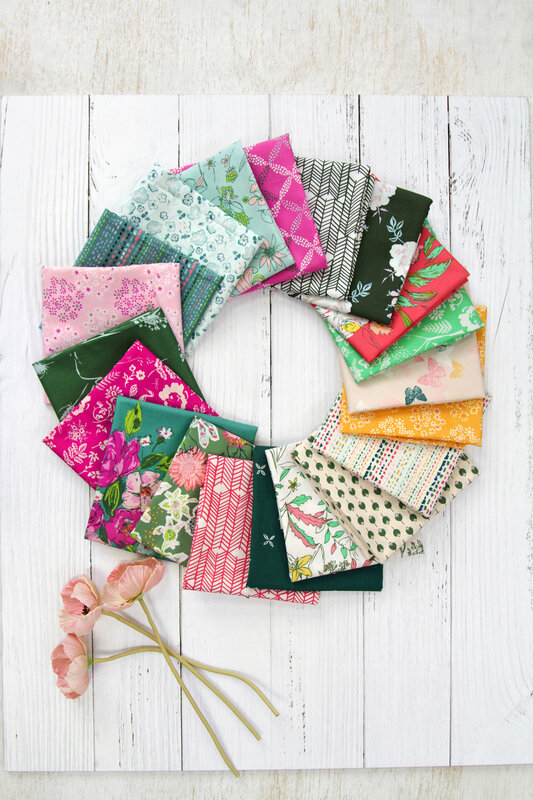 Other favorites like Fat Quarter Shop and Needle in a Fabric Stash also carry the full line. Find these fine shops and more listings on my Fabrics page. See you Friday when I post my next block in the My Signature Sampler and announce the next great giveaway! 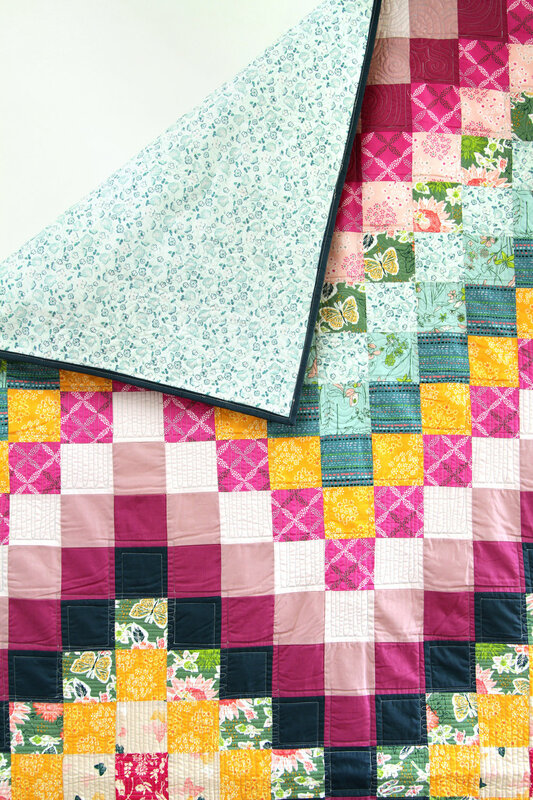 Spontaneous quilt designed by AGF Studio (free pattern)! It's such an exciting day when Art Gallery Fabrics publishes the Look Book for a fabric collection and even more exciting when it's my Signature fabrics! Signature fabrics can be found at your local quilt shop (or if not, be sure to ask for them to be stocked!) and online fabric shops like the ones listed on my Fabrics page. 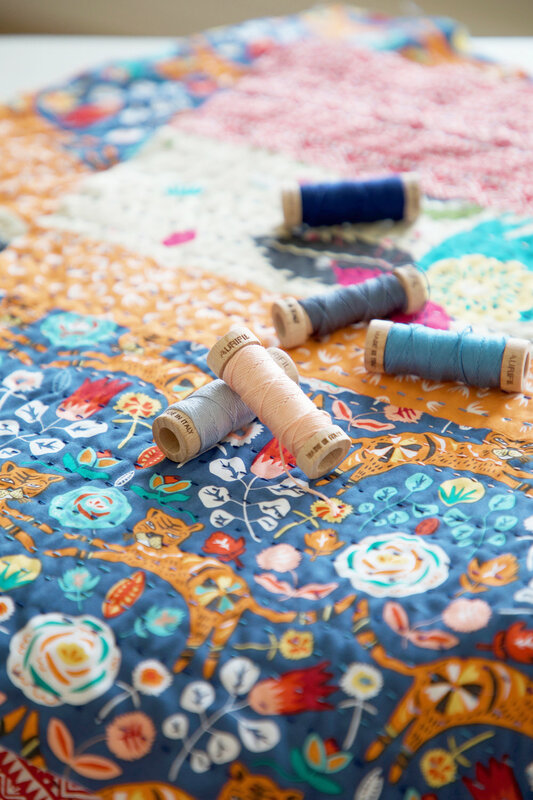 Find sewing inspiration within the 68-page Signature Look Book filled with beautifully curated projects and images. Floral summer dresses for that comfortable yet always put together look are a fashion must this year! Discover cute bag and tote ideas and show off your Signature style! 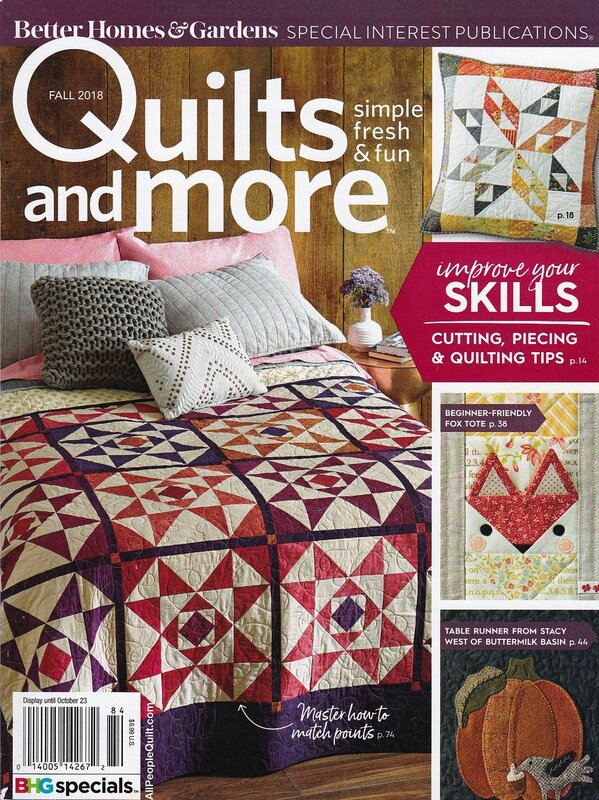 Let's not forget the quilts! 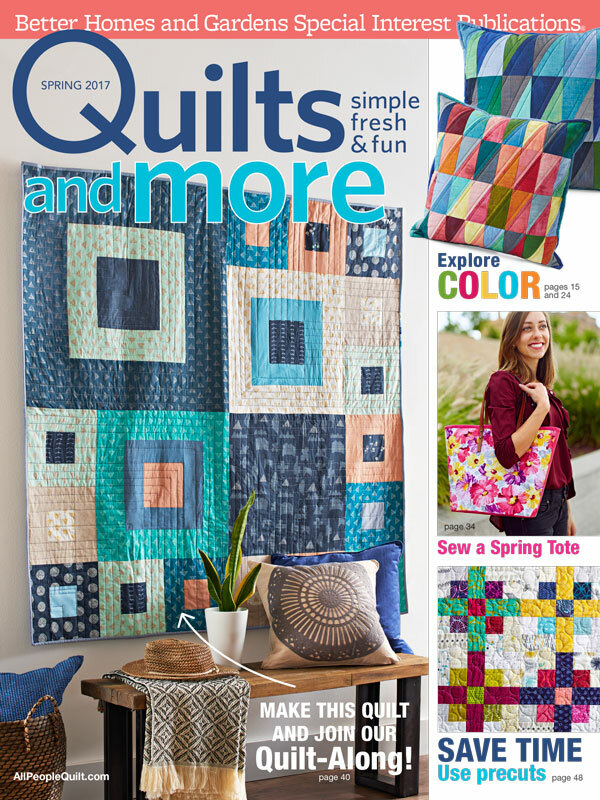 Download the free Sunflower quilt I designed for this collection or the gorgeous Spontaneous quilt designed by AGF Studio. I've been wanting to sew a second sampler with my Signature fabrics ever since my pretty bolts arrived and have come up with an idea for a low-pressure, summer to fall sew along that will be as fun for me as it will be for you. 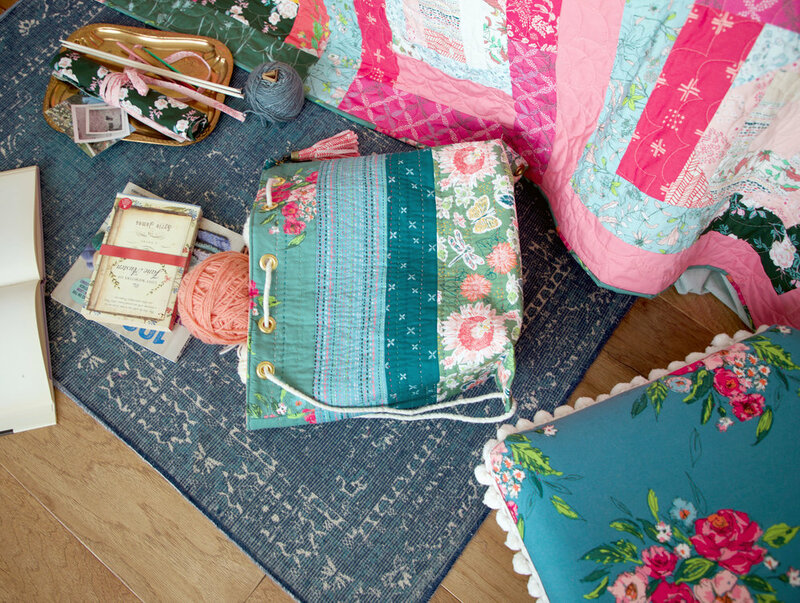 Starting this Friday for 17 weeks, I will host the My Signature Sampler sew along. Every Friday will be show and tell of a block plus the weekly giveaway all in one post. More details this Friday June, 22nd. If you want to get a jump on the Instagram hashtag pool, share the above sew along graphic along with the #mysignaturesampler hashtag. Follow me on Instagram @sharonhollanddesigns for inspiration and IG giveaway information. 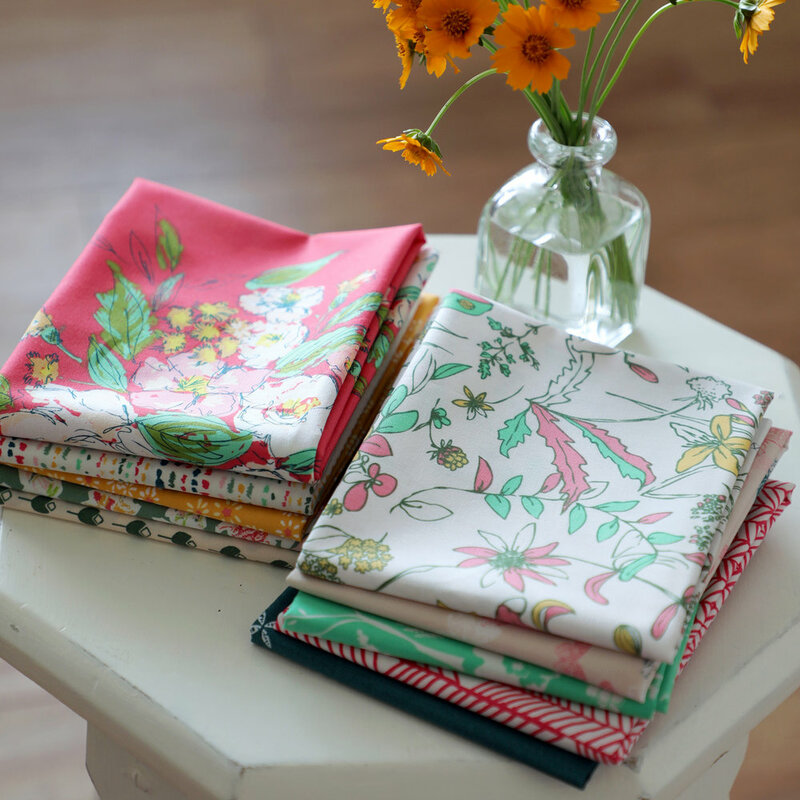 For a chance to win a bundle of Signature fabrics, visit the AGF Blog and enter to win! This month my sixth fabric collection, Signature for Art Gallery Fabrics hits the shops. I couldn't be more excited to share this collection with you in the form of new, free projects! As the industry gathers in Portland, Oregon this weekend for the Spring Quilt Market, I'm staying home and opted out of displaying my new collection at the show. My decision not to go stemmed from several reasons. One, my second grandchild arrived in April and I took a break from work to go lend a hand. That put me way behind in my normal market prep sewing but I wouldn't have missed being present for the birth for the world! Two, I decided, in advance that if I stayed home I would finally remodel my sewing/guest room in my house and turn it into a proper studio space so I could stage different photography scenes for my projects. I was actually able to remodel my room and buy some new props for less than it would have cost me to go to the show and now I can bring you more and better displays here from home. This is just a tiny peek into the first of several Signature Looks. Over the next few weeks I will be posting new, free projects and a closer look into each set up. As always, be sure to watch my feed and Stories on Instagram for even more, day-to-day posts. You first saw my Kantha-Style Bucket Bag when I took part in Jessica Swifts Tallinn blog tour last month. I just didn't have the time then to write up the pattern for it then, and thank you for being patient till I could get it prepared. There were so many asking for this pattern after I posted about it I decided to remake it in my new Signature fabrics, get the pattern written, and include it in the Signature LookBook coming out next month. You'll find the free PDF download for my Bucket Bag on the Free Patterns page of this blog. Bag details include hand-quilted stitching with Aurifloss embroidery thread on the exterior of the bag, eight roomy interior pockets, and fun embellishments like Extra-Large Eyelets and Swivel Hook, and Tassel Cap from Dritz. For the interior of the bag I used Art Gallery Fabrics Smooth Denim (DEN-S-2007) in Nectarine Sunrise and Lateral Bud Profusion (SGN-68710) for the pockets. For the exterior of my bag I use (from the opening to bottom) Extempore Fancy (SGN-58700), Traveler Raindrops (SGN-58705), Lateral Bud Profusion (SGN-68710), and Small World Sprightly (SGN-68713). For a quick tutorial on how to make a tassel using the Dritz Tassel Cap kit, take a look back at the Tallinn blog tour post. There are 20 prints in the Signature collection and comes in two color ways. Between the two color ways there are 14 different prints because in some cases the print only has one coloring. That's what makes this collection so deep and interesting. I'm still making discoveries as I sew! Above is the Foliar color way and below is the Atmospheric color way. 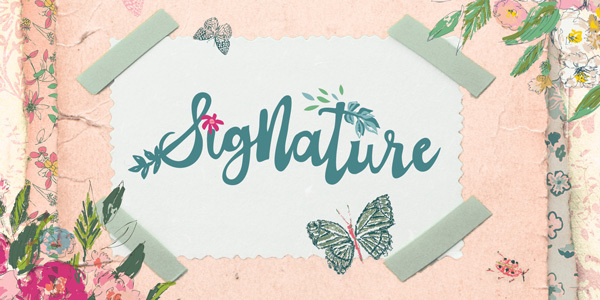 Shops are just getting their stock of Signature in and I've begun adding a few online shop listings to my Fabrics page. Some have already sold out in the first week so keep checking back as they restock and more shops list their new inventory. 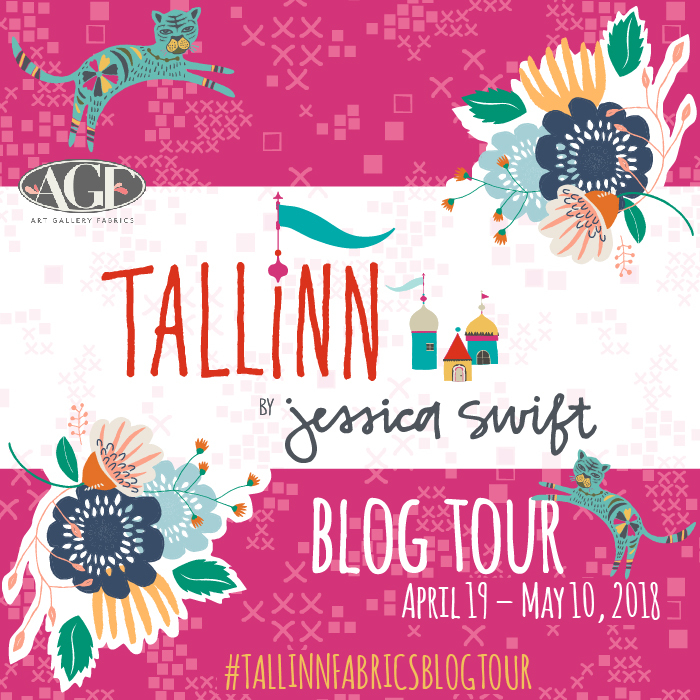 Today's my stop on the Jessica Swift Tallinn blog tour! Tallinn is Jessica's first fabric collection for Art Gallery Fabrics. Now available in shops, Tallinn is inspired by Jessica’s travels through Eastern Europe. Picturesque Estonian villages, graceful swans, & a deep love for combining quirky folk motifs come together in her playful collection. I was thrilled when Jessica asked if I wanted to be part of her tour and sew with these beautiful fabrics! Here's the amazing line up of talented designers also posting about their makes. I knew I wanted to play with texture and enhance the ethnic vibe of these prints with Aurifloss embroidery thread so I decided to make a quilted duffle bag. I want to tell you right up front there's no pattern for this bag. It's something I've designed but there just isn't enough time in the days to do it all so I'm very sorry not to be adding a pattern in with this post. Instead, we will enjoy Jessica's prints and learn more about some of the products used to make this fun bag. The fabrics used in my bag are: Tigris Indigo, Magija Pumpkin, Baltic Swans Sky, Lore Rooftop, and Odessa Dream. Simple, varied width strips of fabric were sewn together into panels for the front and back of the bag and I free-form, hand stitched chunky running stitches with 3-ply strands of the 6-ply cotton Aurifloss embroidery thread. To keep adding texture and interesting details to my duffle bag I incorporated Dritz Extra-Large Eyelets in this marvelous antique brass finish to the closer-edge of the bag and on the boxed corner tabs. Eyelets are super easy to apply with the kit and a hammer. Another Dritz product used in this project is their cording for the drawstring and a little extra bling with a tassel made using Dritz Tassel Cap kit. I loved this natural color of the Dritz Twist Cord that picked up the colors in the Odessa Dream tan floral in Jessica's collection. Can you believe I've never made a tassel before with these awesome tassel caps!?!? It's so easy! I used Art Gallery Fabrics solid knit fabric. I simply cut a piece of knit and folded it widthwise. Then I took a pair of shears and snipped fringe through the folded layers, leaving the folded edge uncut. To make the tassel I followed the directions on the back of the Dritz Tassel Cap package and used Aleene's No-Sew Fabric Glue to roll the knit tassel and attach to the antique brass cap. Inside my bag I've used more of the navy Tigris Indigo print along with the fun Baltic Swans Sky print for the pockets. Plenty of pocket room to tote all your gear on your next vacation get away, quilting workshop, or wherever you wander! I hope you've enjoyed my stop on the Tallinn blog tour! Be sure to follow along with the other makers and on Instagram by following the hashtags #TallinnFabrics and #TallinnFabricsBlogTour.